Talk about turning the air blue. And I thought Wesley Bryan was such a good wholesome guy. 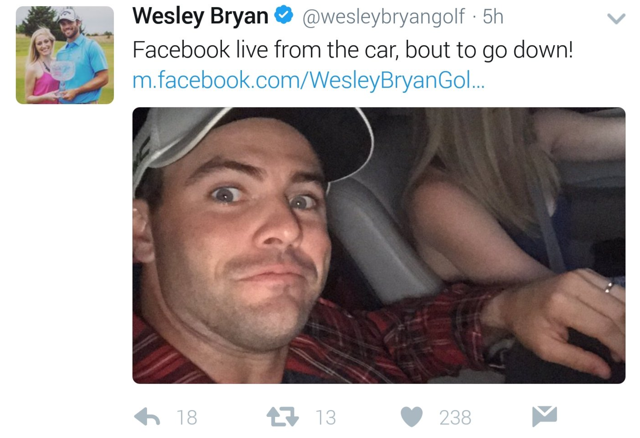 After winning the RBC Heritage Wes tweeted a picture of himself in a car with his wife Elizabeth and informed fans he was "bout to go down." He even invited fans to watch the whole thing on Facebook live. Isn't that what they call dogging? Wes has "that look" in his eyes as he invites fans to watch him going down as his unsuspecting wife drives car. Oh wait....it was all innocent! In winning The RBC Heritage Bryan gained a +8.4 strokes versus the field on approach shots at Harbour Town with his Callaway Apex Pro 2016 irons. Every chip in Bryan's trick shot repertoire was employed with his Cally MD3 milled wedges and he gained 2.9 strokes putting on Sunday with his Odyssey Metal X Milled #2 putter. The week didn't go quite as well for Ian Poulter who is nearing the end of his medical extension events after missing four months last year with a foot injury. Though in contention for long periods Poults finished T11 and his cheque of $114,045 means he'll need to win approximately $30,000 this week in his final event in Texas to keep his PGA Tour card. Driver: Callaway GBB Epic (8.5 degrees) with Mitsubishi Rayon Diamana Blue S+ 70TX shaft. 3 Wood: Callaway GBB Epic (15 degrees) with Project X HZRDUS Red 75X (6.0-Flex) shaft. Hybrid: Callaway Apex (18 degrees) with Graphite Design Tour AD-DI 95X Hybrid shaft. Irons: Callaway Apex Pro 2016 (4-PW) with True Temper Dynamic Gold Tour Issue X100 shaft. Wedges: Callaway MD3 Milled (50, 54), Callaway Mack Daddy Forged (58) with True Temper Dynamic Gold Tour Issue S400 shafts.